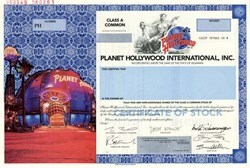 Beautifully engraved SPECIMEN certificate dated 1/12/98 from Planet Hollywood International, Inc. 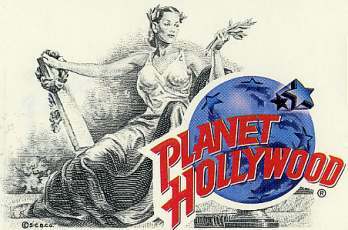 This historic document was printed by the American Bank Note Company and has an ornate border around it with a vignette of an allegorical woman sitting behind the company logo. This item has the printed signatures of Demi Moore, Bruce Willis, Arnold Schwarzenegger, and Sylvester Stallone as well as the company's officers. Arnold Schwarzenegger is currently the California Governor.